We’ve been hard at work improving the Trucker Path Pro app, and we’ve got lots of new features to share with you. Here is just some of what we’ve been working on. It’s been a busy news week in the trucking industry. The ELD mandate was just made official. Thousands of you helped deliver for Wreaths Across America. A new safety fitness determination could be on it’s way. It’s hard to keep up with all of the trucking news. That’s why Trucker Path Pro now gives you direct access to the information you need. 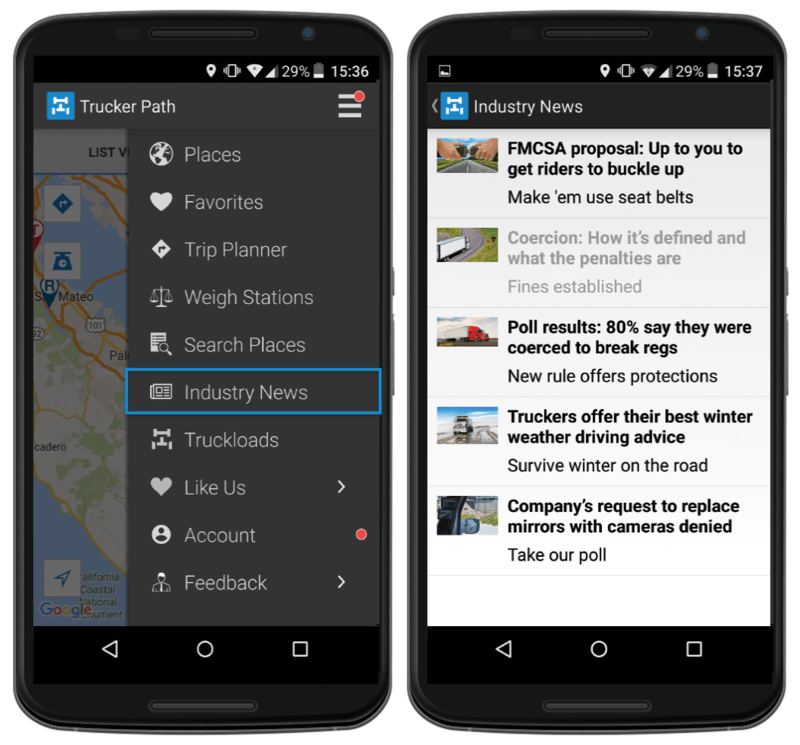 If you’ve downloaded the newest Trucker Path Pro update, you may have noticed the new Industry News option on the menu. When you tap this option, your smartphone opens a menu containing headlines from the Truckers News website. You can tap one of the headlines to read the full article and keep up with this ever-changing industry. At Trucker Path, we care about your safety and the safety of others out on the road. Because of this, we’ve implemented an alert to warn our users about the dangers of distracted driving. The alert appears on your screen if you operate Trucker Path Pro while moving. We recommend pulling over, using a hands-free setup, or, if possible, asking a passenger to operate the app. Please remember, you can be subject to a hefty fine from the FMCSA and a 10 point CSA violation if cited with violation for using a handheld device while driving. A lot of folks have been notifying us about some unsavory user comments in place reviews. We at Trucker Path take community seriously, and we know the foundation of a great trucking community is respect. So, we’re working hard to moderate offensive comments and make Trucker Path Pro a place where all truckers can contribute to building a stronger community. Our approach to solving this problem includes a few different phases that we’ll be rolling out over the coming months. First, though, we wanted to notify everyone of the new comments policy in Trucker Path Pro: In order to build a constructive community of truckers, comments containing lewd, threatening, or explicit language are prohibited. We’ve added a notification to the app which contains the new comments policy. Currently, the notification is only available for Android users, but don’t worry – we’re working hard to create a notification for iOS users too. In the meantime, we encourage all Trucker Path Pro users to be kind and respectful to one another. You spoke, we listened – and we’re glad we did. We’re constantly striving to improve so we can be more helpful to truckers. Building our app based on community feedback is big part of what makes Trucker Path Pro so useful. Nothing complicated, no frills. Just truckers helping other truckers. Here at Trucker Path, it really is that simple.